Mr. Lamb saw no occasion to reply to this piece of flamboyancy. Mr. Lamb’s best friend is his twentyish daughter Hebe, a flapper whose wild and free spirit he appreciates. The two have been forced together by Sapho’s disapproval of their lifestyles; of his refusal to approve and participate in her pretentious social activities, and of Hebe’s refusal to act “like a lady”. Hebe is currently being abetted by her equally uninhibited friends; Sandra Rush, a lingerie model who has proclaimed her intention to seduce Mr. Lamb, and Melville Long, a lounge lizard (his two accomplishments are playing golf and getting drunk) whom she intends to marry. Mr. Lamb subconsciously yearns to join them, but he is too inhibited by their age difference and his lifetime of respectability. “The horse was listening intently, ears pitched forward, and at this last remark he winked slowly and deliberately at Hebe. The girl was amazed. It was her father all over. At that moment she accepted the fact that something strange had occurred. Then after a few minutes of thoughtful consideration, looking this way and that as if to determine the best way of procedure, Mr. Lamb cautiously got himself out of bed, but not without considerable clattering and convolutions. Hebe watched him with amused interest. She knew it was her father. Mr. Lamb thought of his best pajamas, and throwing back his head gave vent to a wild neigh. He was feeling rather wild and at the same time a trifle timid. He had often played horses as a child, but never actually been one. Now he tried to recall just how he had gone about it in those early days. He wondered how he looked, what sort of horse he was, and, remembering his full-length mirror, he stepped delicately across the room and, sitting down in a strangely unhorselike attitude, lowered his neck and gazed at his reflection. Bending an eloquent glance upon his daughter, he pointed with his hoof to the mirror. Obediently the girl went over to the mirror and after much shaking and nodding of her father’s head, she adjusted it to his satisfaction. ‘That’s something like,’ thought Lamb, surveying his reflection with no little satisfaction. He was a fine body of a horse – a sleek, strapping stallion. Black as night with a star on his forehead. He turned slowly, taking himself in from all angles. “Fluttering lightly to the floor, he observed himself in the mirror. His excitement was intense. What he saw was a smoky-looking seagull with black rings round its eyes. The effect was that of detached thoughtfulness. Mr. Lamb spread his wings and looked with approval on their snow-white lining. He was a good gull. “At a late hour that night he was still drinking highballs and running up a commendable check at a night club for the benefit of Sandra, his daughter, and Melville Long. Mr. Lamb had danced with more diligence than grace. Now, however, he was past dancing. In fact, if the truth must be known, Mr. Lamb was rapidly disappearing, the top of his head being level with the table cloth, and in a few minutes even the little of him with which he saw fit to grace the table was withdrawn from public view. The party looked down and saw what the waiter saw – a long, large, tawny tail protruding from under the table. ‘What’s on the other end of it?’ asked Sandra. Hebe bent over and thoughtfully contemplated the tail. ‘Perhaps it’s an altogether new and better animal,’ Mr. Long suggested enterprisingly. He pulled a flask from his hip pocket and passed it to the ladies. The situation called for a drink. At this moment Mr. Lamb decided to relieve the tension of the situation. A long, sleek head with a pointed snout appeared above the table, slid onto the rumpled cloth and looked moistly at the three young people. In the due course of time the head was followed by a body, which slumped back awkwardly in its chair. 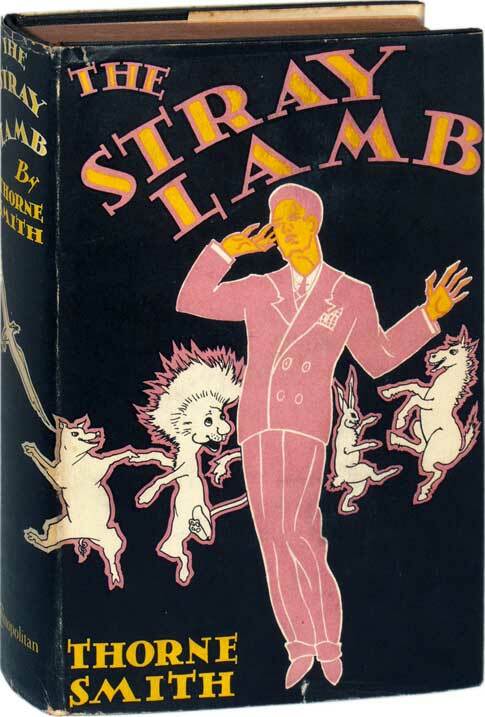 The Stray Lamb has been in and out of print many times since 1929. It is in many public libraries, and it is out of copyright so there are several free complete reprints on the Internet. It is also included in The Thorne Smith 3-Decker (Doubleday, Doran and Co., 1933; also reprinted often and on Amazon.com) with his Turnabout and Rain in the Doorway; the latter two not anthro but very funny fantasies. The department store in Rain in the Doorway has a pornographic book department. The transformations in The Stray Lamb do not begin until fifty pages into the story, but they are witty and hilarious after that.